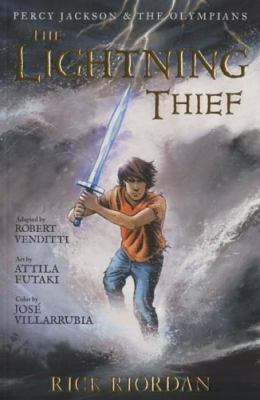 I figured I’d put the graphic version of The Lightning Thief to the test by having my son read it. He and I loved the entire Percy Jackson series (the original Lightning Thief is reviewed on this blog). He told me that it really does stick closely to the original story. Since I’ve been working with our wonderful new EL 1 students at Chaffey High in the past few weeks, I’m happy that The Lightning Thief is one of the books we are getting free for each school–Colony and Chaffey–after sponsoring a Scholastic Book Fair at both. Come on in and check it out–as well as the other brand new graphic novels we received from the fairs. This entry was posted in Fable/Fairy Tale/Fantasy, Fiction, Graphic Novel, Hi-Low/Quick Read, Movie Tie-In, Supernatural, Young Adult Literature and tagged Percy Jackson and the Olympians. Bookmark the permalink.